Boil the potatoes in salted water until soft. Cut the fillet into large pieces and place in a bowl. Add salt, pepper and lemon juice, mix and leave while you prepare the remaining ingredients. Melt the butter in a saucepan or small saucepan. Pour the flour and, stirring, cook a couple of minutes. Continuing to stir, gradually pour in the milk. Add nutmeg and cream cheese and, while stirring, simmer the sauce until thick. Cut the onion into thin half-rings, and boiled potatoes - into slices. Put the fish in a greased form. Spread onion, part of the sauce, potatoes and pour the remaining sauce on top. 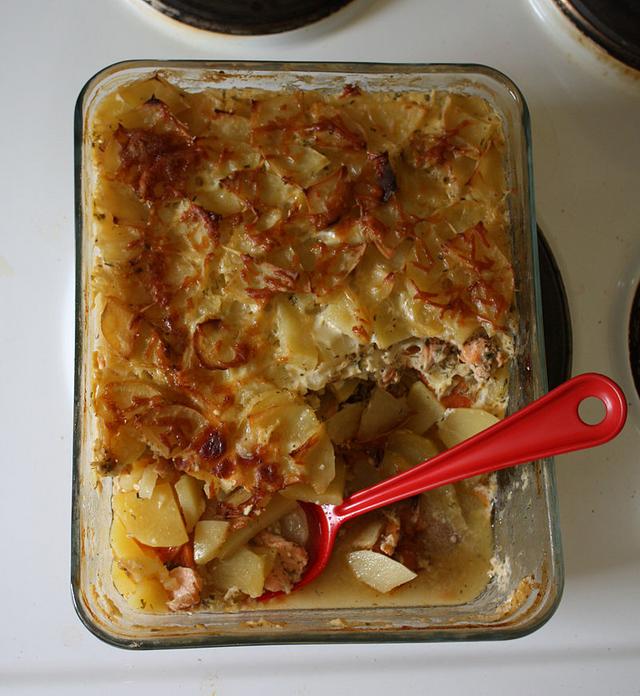 Place the casserole in a preheated 180 ° C oven for 30–35 minutes.